For the longest time I've refused to join Twitter, but a few weeks ago I gave in and joined @MangoTomato. That's how I found out about Foodie Fights: bloggers sign up to battle it out and receive two ingredients they must include in their dish. This time around, the two ingredients are pumpkin and bulgur. As soon as I received the "assignment/challenge," I was terrified. I've never cooked with pumpkins and could not think of too many ways to combine it with bulgur. Who knew finding a pumpkin would be so hard? I finally found one pumpkin at Whole Foods, but it had began to rot. I pleaded with the produce guy to sell me just half of that pumpkin (the half that was still intact), and he agreed! 1. Heat oil in a pot, add onions, garlic and ginger and saute for 3 minutes. 2. Add cubed pumpkin and saute for 5 minutes. Season with salt & pepper, cover the pot and cook for 5 more minutes. 3. Add vegetable broth, curry paste and lentils. Stir and bring to a boil. Cover the pot, lower the heat and simmer for 5 minutes. 4. Add bulgur and simmer covered for 10 minutes. The bulgur will soak in most of the liquid. 5. Adjust the seasonings and serve immediately. This dish is hearty enough to be served on its own or can be used as a side-dish. This will be put to a vote on Tuesday: Vote here. I think that looks really good! And I'll bet it tastes fantastic! Yum. You know I'll be voting for you! *hugs* Well done! The photos are really not that bad! It least it sure looks quite delicious! Well done on the challenge! I don't think the photos are unappealing, just a little bland. Its the all one color problem, however I love what you did with this. I am always trying to figure out ways to eat squash and pumpkin that are savory instead of just adding them to my baked goods. I think I will be trying this soon, when my Winter CSA over gifts me with squash. 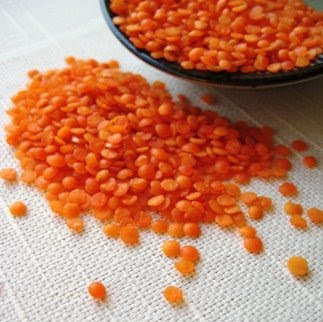 I love red lentils. I know it's psychological but I think they taste better than their plainer cousins. You know, I've been on twitter for a while an I've never heard of this foodie fight, I'm going to look it up. Great entry! Even if it doesn't look the prettiest, it sure sounds tasty... I'll be giving this recipe next time I'm in a vegetarian sort of mood, though I think I might get in trouble if I make anything else with pumpkin in the next month. :) Good luck with the Foodie Fight! Hard to find a pumpkin??? Unbelievable! You pulled out a good recipe with the pumpkin and bulgur combination. Not an easy feat. What a great idea! I'm looking for more savory ways to use pumpkin (besides soups) and this is a wonderful recipe! It was great meeting you at the bake sale on Saturday! Thanks for helping out! Your dish does not look ugly...interesting combination og ingredients...sound yummie! This look great,Olga!My vegetarian husband would love this dish.